Before you can share your Excel 2016 workbook, you must save a copy of it in a folder on your OneDrive. The easiest way to do this is to first open the workbook to share in Excel and click the Share button that appears on the right side of the Ribbon. Excel then opens a Share task pane in your worksheet with a Save to Cloud button. Click the Save to Cloud button to have Excel open the Save As screen in the Backstage View where you can save the workbook in a folder on your OneDrive. Once you’ve saved the workbook on your OneDrive, Excel returns you to worksheet view with an updated Share task pane similar to the one shown here. Inviting co-workers or clients to share an Excel workbook saved on your OneDrive in the Share task pane. Click the Invite People text box in the Share task pane and then begin typing the e-mail address of the first person with whom you want to share the workbook. As you type, Excel matches the letters with the names and e-mail addresses entered in your Address Book. When it finds possible matches, they are displayed in a drop-down menu, and you can select the person’s e-mail address by clicking his or her name in the list. To find e-mail addresses in your Address list and add them to this text box, click the Search the Address Book for Contacts button (to the immediate right of the Invite People list box) and then use the options in the Address Book: Global Address List dialog box. To share the workbook with multiple people, type a semicolon (;) after each e-mail address you add to this text box. (Optional) Click the Can Edit drop-down button and select Can View option on the menu to prevent the people you invite from making any changes to the workbook you’re sharing. By default, Excel 2016 allows the people with whom you share your workbooks to make editing changes to the workbook that are automatically saved on your OneDrive. If you want to restrict your recipients to reviewing the data without being able to make changes, be sure to replace the Can Edit option with Can View before sharing the workbook. (Optional) Click the Include a Personal Message with the Invitation text box and type in any personal message that you want to incorporate as part of the e-mail with the generic invitation to share the file. By default, Excel creates a generic invitation. As soon as you click the Share button, Excel e-mails the invitation to share the workbook to each of the recipients entered in the Invite People text box. The program also adds their e-mail addresses and the editing status of each recipient (Can Edit or Can View) at the bottom of the Share task pane. All the people with whom you share a workbook receive an e-mail message containing a hyperlink to the workbook on your OneDrive. When they follow this link, a copy of the workbook opens on a new page in their default web browser using the Excel Online Web app (if the web app is not compatible with the type of browser in use on their device, the browser opens it with the web viewer). If you’ve given the user permission to edit the file, the web app contains an Edit Workbook button. When users click this button in Excel Online, they have a choice between selecting an Edit in Excel and Edit in Excel Online option on its drop-down menu. When they select Edit in Excel, the workbook is downloaded and opened in this version of Excel. 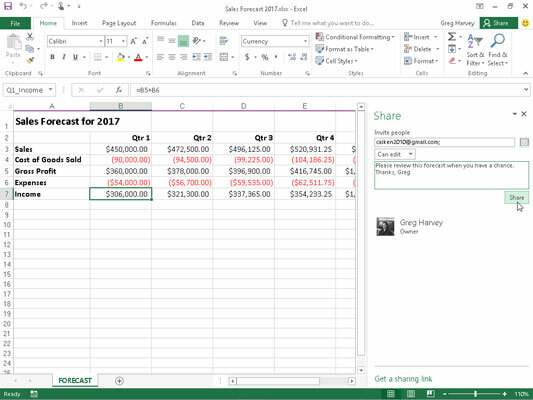 When they select Edit in Excel Online, the browser opens the workbook in a new version of Excel Online, containing a File button and Home, Insert, Data, Review, and View Ribbon tabs with a more limited set of command options than Excel 2016 that can be used in making any necessary changes (which are automatically saved to the workbook on the OneDrive). You can also share a workbook previously saved on your OneDrive. Simply open the workbook in the OneDrive folder where it’s saved and then click the Share button on the Ribbon. Instead of sending e-mail invitations to individual recipients with links to the workbooks you want to share on your OneDrive, you can create hyperlinks to them that you can then make available to all the people who need online editing or review access. To create a link to a workbook open in Excel 2016 that’s saved on your OneDrive, you click the Get a Sharing Link option at the bottom of the Share task pane. When you click this link, an Edit Link and a View-only Link text option appears in the Share task pane. To create a view-only link that doesn’t allow online editing, simply click the Create a View-only Link button Edit Link text box in the Share task pane, and Excel displays a hyperlink in the button’s text box with a Copy button now appearing to its immediate right. To create an edit link that enables online editing instead of a view-only link or in addition to it, you click the Create an Edit Link button in the Share task pane. Excel then displays a hyperlink in this button’s text box and a Copy button now appears to its immediate right. After creating a view link or edit link for your workbook in the Share task pane, you can select the entire hyperlink by simply clicking the Copy button that appears to the immediate right of its text box. When you do this, Excel copies the long and complex hyperlink to the Office Clipboard (Ctrl+C). After copying it to the clipboard, you can insert it into a new e-mail message (Ctrl+V) that you send to all the people with whom you want to share the Excel workbook to which it refers.